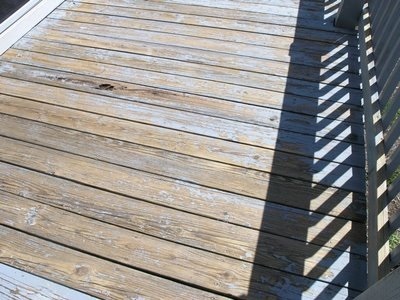 Home / / Refinishing my very rough pressure treated wood deck. Here in a nutshell is what I did to fix up our neglected deck. Apply paint and finish remover. Wait for it to work while keeping from drying out. Used a stiff brush with handle to work old opaque sealer up. Powerwasher, 2,600 PSI, I know enough to damage wood, but it was in such bad shape anyway. Pound down all nail heads, replace or fix screw/nail pops. Sanding boards with 6″ Random orbit sander (60 grit). 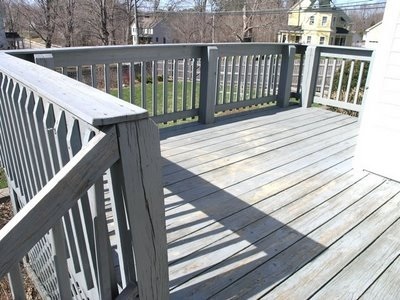 Sanded railings and other details with 5″ RO sander (60 grit). Blew off dust with leaf blower. Take a step riser board to the local paint shop for an expert review of what I had on there. I didn’t remove all of the original stain. 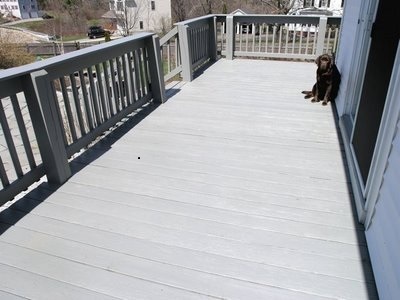 Applied Sikkens Opaque deck stain.